Axis of an Airplane in Flight. An airplane may turn about three axes. 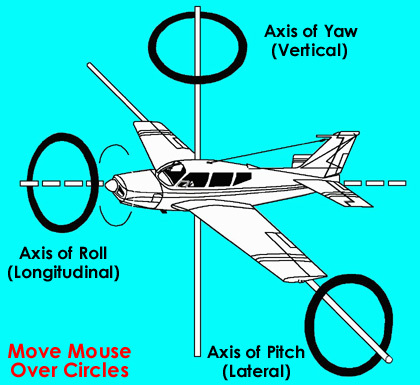 Whenever the attitude of the airplane changes in flight (with respect to the ground or other fixed object), it will rotate about one or more of these axes. Think of these axes as imaginary axles around which the airplane turns like a wheel. The three axes intersect at the center of gravity and each one is perpendicular to the other two. Move mouse over the circles to see additional text below. Created June 3, 2002. Updated June 7, 2015.